Keep your work environment organized with labels built to stand tough. Organize and identify equipment, containers and shelf space in areas where rougher conditions prevail. Designed to withstand wear and tear, sun and moisture and other harsh conditions. Keep your work environment organized with labels built to stand tough. Organize and identify equipment, containers and shelf space in areas where rougher conditions prevail. Designed to withstand wear and tear, sun and moisture and other harsh conditions making them ideal for warehouses, storage rooms, work-sites, hospitals, and classrooms. Self-laminating ID labels are water resistant, UV resistant and tear resistant to handle these tougher surroundings. The labels are easy to apply, with no laminating machine needed. Simply lift the clear laminate and write on the surface underneath (permanent marker works best), then remove the protective backing paper from the laminate and press firmly over the label. The clear, over-laminate film provides added protection and the permanent adhesive works on plastic, wood, metal, rubber, paper, ceramic, glass and more. Labels won't tear or fade and will keep your tough work environment organized. Label Size 3¾" x 2¾"
Avery Self-Laminating labels are designed to withstand sun, moisture, wear and tear, and other harsh conditions. Great for worksites, warehouses, storage rooms, hospitals, school and classrooms, and more. 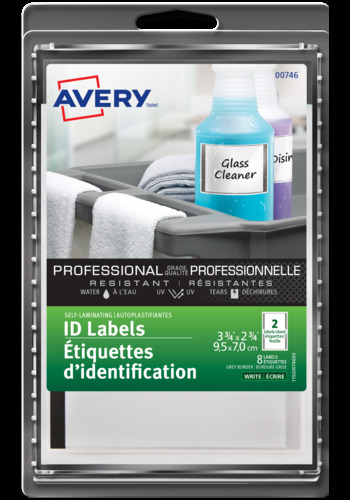 Avery Self-Laminating labels create perfectly laminated labels every time! They are easy to apply without the need of an expensive lamination machine. Clear, over-laminate film provides added protection. Easy to Apply! Use Self-Laminating labels to organize and identify frequently used equipment, containers, shelves, bins, outdoor equipment, and more. Ideal labeling solutions for companies and industries such as Healthcare, Health and Safety, Janitorial and Sanitation, Transportation and Logistics, Facilities and Maintenance, Repair and Operations.